Blocking/unfollowing the malicious cowards of social media. “Social” media has given rise to the most impersonal public whining in the history of civilization. Never in time have we been able to so readily make a complaint against an individual or individuals with nothing more than general, noncommittal rhetoric and nonspecific public shaming. Disappearing are the days when one would speak directly to the individual(s) for resolution. Many have lamented the effects of anonymity online in respect to the author of posts, but it seems the same anonymity applies to the recipient of posts, even when said recipient cannot possibly be aware that s/he is the target because the person posting hides behind the ability to be nonspecific. Often, when pressed for details, the posting offender hides behind just enough information to garner support for the nonspecific post from the poster’s “friends,” but not enough to allow the “offending” party any recourse. It is with cowardly malice these individuals post these tirades and diatribes to social media. There are steps to take to rid timelines of such drivel. 1) Unfollow the poster. 2) Block the poster if unfollowing isn’t enough 3) Unfriend the poster if the negativity brought by that person only serves to affect one’s own well being. Online in the "Early Days"
I received my first computer when I was in about 8th or 9th grade: a Commodore 64 with a tape drive. A few months later, I had a 1541 floppy drive and a modem. And my world changed forever. In those days, we didn't have a worldwide, publicly used communications network. Yes, the Internet was there, but very few people (in the scheme of the population and compared to today) knew what it was and how to take advantage of it. Forgive me if my timeline gets a bit wonky here, it's been a few sleeps since I have thought about these early days and though Google helps put some of it together, much of it seems to be lost to annals of an unrecorded history. I don't remember if I started using CompuServe first or if I was surfing BBSs first, but I believe it was the latter. BBSs were Bulletin Board Systems where one could use a modem to dial up (yes, using actual phone lines) another person's computer, enter a username and password, and post messages to other users. Hence, the "bulletin board" nomenclature. It was, in effect, an electronic post-it note system. When your time was up (sessions were time-limited to allow for other people to call in), you were kicked off and someone else would dial up, sign in, and reply or leave messages of their own. It was all VERY asynchronous. Then, we had services like CompuServe, which boasted "rooms and rooms" of places for people to post messages based on topics and/or content interests. Of course, CompuServe became much more than that over time before finally getting swallowed up by America Online. CompuServe had a place where people could type to each other in realtime! Today, that seems all rather blasé, but in those days, it was a free-for-all technological marvel. Now, you have to understand that this was all text-based in those days. We didn't have the "web." Heck, the WWW wouldn't even be a thing until 1993 or so. Sure, there were other ways to get around the Internet, but nothing that was the graphical/video overload we have today (Er, today being 2018. Should this be read by some future generation, this article will seem like words on an ancient scroll, I'm sure). We also had the advent of things like "FidoNet" (A national BBS that replicated data from system to system, allowing anyone anywhere to dial a local number yet read messages from everywhere!) and ultimately services like the aforementioned America Online, PeopleLink, and a myriad of others. In each of these cases, though, the end user had to use phone lines to dial a number in order to gain access to the system. The prevalence of BBSs was huge. We're talking hundreds of thousands of individuals using their own computers to host places for people to dial in. For several years, I ran one based loosely on The Hitchhiker's Guide to the Galaxy, called "Arthur's Den" (See how punny I was?). At first, I ran it at night because I was using the family's home phone number to do it. Can you imagine? Publishing your family's home phone number out there for the world to call in at 2am? But, that's what we did. Eventually, I was allowed to have my own phone with a new number. I was in 9th grade. BBSs were so popular, there were entire magazines dedicated to listing them each month! That would be like having a magazine today that attempted to list every website address each month. Insane. As technology changed, we moved from text-based online services to graphical. We now had "icons" and email and chat rooms and games we could play through the online services and BBSs. You could have an avatar to represent you online (Okay, so it was a pixelated static image, but still). I actually met my first long-term girlfriend through the BBS I ran. We dated for two years. She had signed in to my system and I happened to be sitting near the computer at the time. In those days, you could not multitask: your computer did one thing at a time. So, if it was running your BBS, you weren't doing anything else with it. She came on, and if memory serves, she had requested a chat with the sysadmin (me). The software I used on my C64 allowed for the one logged in user and the system administrator to chat in realtime. She had a question about something on the system and we ended up chatting well beyond the allowable time period. As a sysadmin, I could extend user's time at will. Time went by and we eventually discovered that we lived about half a mile from each other. We met face-to-face one day and ended up dating for two years. Who knew Internet dating had such simple beginnings, right? Over time, services came and went. Dial-up phone lines (for the majority of folks) were replaced by ADSL and eventually DSL, Cellular, Satellite, etc. But, those early days of entering a phone number, having the software and hardware work together to make a digital connection, and then seeing the world come onto your computer screen were unlike anything that had come before, and "blogging" wasn't even a word yet. As I was planning my trip to Chicago for ISTE 2018, I was encouraged to pick a couple of times to volunteer and help out with the conference. I chose a 2-hour stint as an "Ask Me" helper and a 2-hour stint on a different day to help in ISTE Central. Here's the good, the bad, and the ugly. Okay, maybe not ugly. ISTE volunteers receive a conference-themed t-shirt and a volunteer-only "shoe bag" tote. This really is one of the best reasons to volunteer aside from helping people. As an "Ask Me" station monitor, I worked with my colleague, Jeff. We sat posted outside of the Microsoft Corporate Presentation room on the first floor. We were not given much instruction (see "The Bad" below), so we fended for ourselves as best we could. What were we asked? "What is the name of the street behind you?" 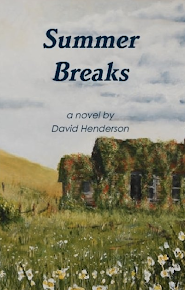 "Where are the keynote authors signing books?" "Where do I get the shuttle bus to my hotel?" "Do you know where the third Playground area is? I was told there is a 'C' area." "Where is the Apple Corporate Room?" A: We used the ISTE app to locate the room, then direct the person to it. "Do you know where (such-and-such vendor) is located in the Expo Hall?" A: We searched for the vendor in the ISTE app and directed the person to it. "What are these tickets for?" A: Various tickets were used for raffles, session entry, etc. We walked through each ticket the attendee had, explaining what to do with each one. "Do you know more about the buffet upstairs?" A: We had no idea. we directed the person to the INFO booth on the third floor. "How many people does Room (such-and-such) sit?" A: We had no idea, but were able to make a guess based on random things we had heard from other ISTE workers. "How do you get to the Hyatt (or Marriott) from here?" A: We tried to figure this out, but even asking PAID folks from ISTE, we could not provide accurate answers. We tried. "Where is Michigan Avenue from here?" A: We found the road via Google Maps, then directed the person toward it. There were MANY other questions as well. As an "ISTE CENTRAL" volunteer, I was assigned "Poster Distribution." Jeff was assigned to the bookstore. My job was to hand out posters of the ISTE student and educator standards to passersby. For the first hour, I hounded folks waiting in line to have books signed by Andy Weir ("The Martian"). It's easy to give away stuff to people waiting in an extra long, slow-moving line. The second hour was not as productive, though I basically shoved the posters in the faces of anyone coming into/out of the Expo Hall. Conference volunteers are given little to no direction and/or instruction. The "Ask Me" volunteers seem to have it worst of all. There is no orientation, no "here are the top 5 or 10 things you need to know, no number/text to use in case someone asks you questions you cannot answer. If you are in a conference volunteer shirt, people assume you are an "Ask Me" person, even if you aren't. Luckily, I had been one, so I knew many of the answers being thrown my way while I was handing out posters. Volunteers are not given/asked for any kind of debriefing after their shift. A debriefing might have helped circumvent some of the above-named issues for future volunteers. I suppose the only "ugly" I can come up with is one attendee talked down to me for not knowing the answer to his question since I was a volunteer. I did let the guy know that I would happy to find out from an ISTE Staff member, but he tromped off. Ah well, you can't win them all. The GOOD of volunteering far outweighs the bad and the ugly. I wholeheartedly recommend volunteering at the next ISTE event! It is a great way to help folks, but also a fun way to meet more of the educators that attend this annual event. Stay Tuned for ISTE 2019! People sending you .HCR files you can't open!? .HCR files are usually created with Broderbund's PrintMaster program. Here's the kick - you generally have to go to your local mega retailer and buy the program to open the card the other person made for you. Now, personally, I'd email the person back and tell them to export it as a JPG or something useful. But, for those that want to see the 'read deal,' here is a solution we came across: A FREE VERSION! We had a user with an automatically-playing Powerpoint slideshow that wouldn't automatically play. It also would not manually play. That's right, the first slide would come up and that was as far as one could get. 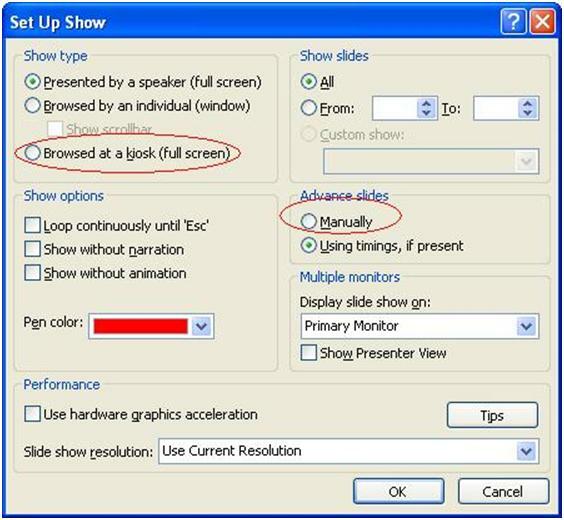 The user had selected BOTH the "Browsed at kiosk" *and* "Advance slides manually" options. In effect, Powerpoint was told to run fullscreen in a mode that prevented user interaction. At the same time, the program was told to advance the slides using ONLY user interaction. 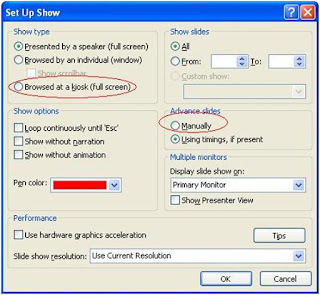 The fix was simple: As shown above, use the "Presenter (Full Screen)" and "Use timings" options were selected and the show ran without a hitch. An ongoing issue with PDFs lately revolve around certain PDFs showing grey placeholders instead of actual images. I have read all kinds of solutions to this, changing all kinds of settings. Some of those changes would work, some wouldn't. After it happened to me again, I thought I would try to find a different solution than what I had been doing (namely, changing the Internet options within Adobe Reader and/or Acrobat Pro). EDIT > PREFERENCES > DOCUMENTS > PDF/A View Mode > Always. The setting is about halfway down the "Documents" screen and is most likely currently set to "Never." Click the drop-down for that and change it to ALWAYS. After that, EVERY grey-boxed PDF I have opened has show the images! Wahoo! UPDATE/EDIT (10/28/10) - Several folks have reported not having an "ALWAYS" option. I am checking into this and will hopefully have a solution soon! We had a user that opened up Outlook Web Access and all she could see was her Inbox. She could use the drop-down to change folders, but the Navigation Pane was gone. I searched the Internet for a solution and several suggested deleting a hidden message in the user's inbox. Turns out the solution to our problem was much simpler. The user's desktop shortcut to her OWA pointed to the actual INBOX and not to the OWA main login page. 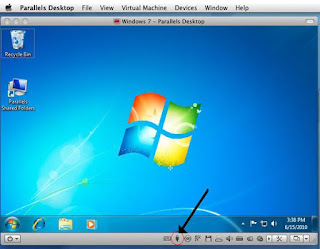 So, if you have a user that can't find the Navigation Pane, check the shortcut on their desktop first. and $p$g are the standard drive and pathname with the greater-than symbol (>). This command caused the system to display the UNC name of network drives. To make this change stick on a Win2K/XP system, you must modify/create an environment variable. You do this by going to Control Panel, then System, then Advanced. From there, click the Environment Variables button, create a system variable named prompt, and set its value to $m$_$p$g. This will make the setting permanently display the remote network path every time you open a command prompt. Microsoft had (or maybe still has) a command line utility called "RoboCopy" that would copy files and folders, retaining their permissions (within same domain/workgroup). That has been replaced (some time ago actually) by a program called "RichCopy." It used to be an internal Microsoft program, but they released to the general public some time ago. I just came across it and thought I would share! The program first needs to be put into Advanced Mode. Do this by clicking VIEW > ADVANCED. The main area that most techie folks will want to explore is "File attributes, Error Handling" because that is where you can set the security/permissions settings. But, notice on this screen above, there is an option for "Directory Copy: 3." This indicates the number of threads that the program will use during the copying process! Yes, that's right, whatever number you specify in there, that's how many different files can be copied at the same time! Well, at least how many can be copying at the same time. For example, if you are copying 2,000 files and you specify "10" in the box, it will start to copy 10 files. If some of those files are large, then the program continues to copy those (using up a thread for each file) but will keep copying with any available threads! This beats the tar out of copying one file at a time! In my case, I had several 400MB files that started, all the while the program plugged away at the smaller files it was encountering. Theoretically, you could have 10 threads all running with a large file copying in each one. I ran into that on my own server. But, it did not take long to muscle through those and pick up copying smaller files at a flying pace. The program is available from Microsoft: HERE! Just run the EXE which will extract several files into a folder on your hard drive called "c:\HoffmanUtilitySpotlight" and in there, you run SETUP. Easy peasy. I also turned off some of the errors that would stop the copying. If the program ran into a file that it couldn't copy, for example, I just wanted it to keep on truckin. I would deal with rogue files later. We had a user who could check email and do other network-related activities, but could not use Internet Explorer to do anything through a browser. 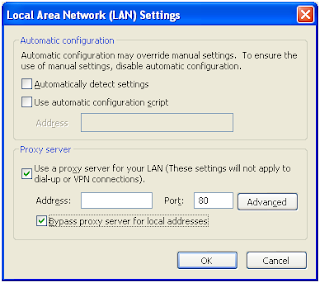 In the TOOLS > INTERNET OPTIONS > CONNECTIONS > LAN SETTINGS section, the "Proxy Server" settings were set as shown above. 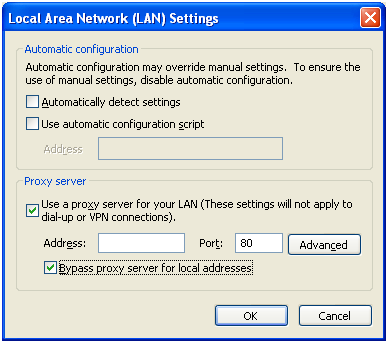 Basically, the system was set up to us a proxy with no address. How did this happen? The machine had been hit by malware. Once the malware was removed, this setting popped up as part of the "fix." If you are a tech, you may see this happen after cleaning a machine. Always check your browser to make sure you can get online following such a clean-up. If the machine cannot access web pages, check here! 1. COPY the Vineland-II folder to the local computer. 4. Select "Windows XP Service Pack 3"
As a side note: You will know you are not installing it correctly if the location reflects the user path instead of the "C:\Program Files..." path. If you do *NOT* see the "Program Files" path during setup, quit the install and follow the steps above. You may also have to TURN OFF the User Account Controls in order for the program to function properly. Notice the SPACE between the label and "is:unread." Then just click "Search Mail" and it will pull up the unread messages in that label category! Wahoo! One of my area schools was having strange problems - some users could not log in, some users got logged in but could not access their redirected home folders, and some users were prompted multiple times while trying to open Outlook. I reotely checked a few things on the server and it appeared the Active Directory, File Replication, and Exchange systems had gone a bit haywire (the word I usually use here is "wonky"). 9:28a - While waiting for the server to shut down, I looked up info for checking/repairing Exchange. When I booted to DSRM, the integrity check came back normal for AD, which was not the same result I had received while remoted in. That is not really surprising. I found a registry entry for "WaitForNetwork" and added that for good measure. I also issued a "DFSUTIL /PurgeMupCache" command. 10:10a - Checked DC2 and found a LOT of ENV ERRORS in the Event Log. i noticed the time was way off from the other server so I reset the time to match DC. The server actually passed the integrity tests and Semanitc DB Analysis. I added the "WaitForNetwork" registry entry and issues the Mup-clearing command. 10:30a (while tests ran on DC2) - Started a defrag on the Exchange Store. 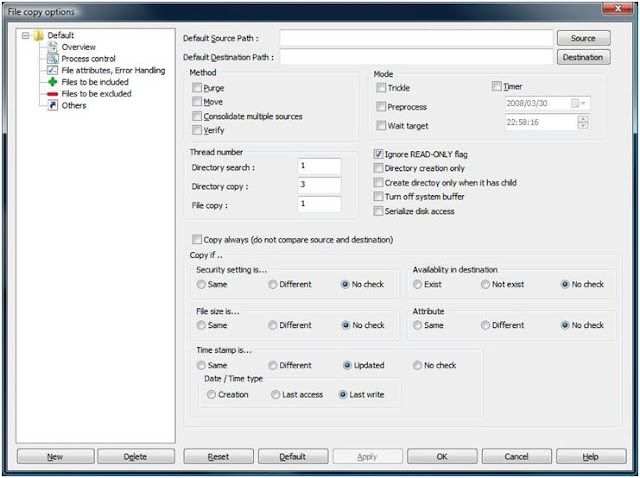 Set the defrag command to create new files, just in case. 10:35a - For grins, I ran GPUPDATE on each server and a nearby workstation. 10:37a - File Replication Services reported that FRS "is no longer preventing the computer (DC2) from becoming a Domain Controller." I took that as VERY good news. On DC2, I reinstalled "Help & Support" per MSDN article (KB937055) since "Help Service" was not installed. 11:40a - Defrag of PRIV1.EDB was at 68% and I had not started PUB1.EDB yet! Yikes! 11:48a - PRIV1 done after 4223 seconds. Ran the defrag on PUB1, and it completed in 9 seconds. I renamed the PUB1/PRIV1 files to something else, then renamed the temp PRIV/PUB files to PRIV1/PUB1 respectively. I then moved the old files to another server for safekeeping. Will delete those later as long as everything works! We tested several users, specifically those having various troubles with logins, documents, etc. Everything checked out fine! Is your GMail Inbox overloaded with messages? Have you tried using labels for your mail, but you find yourself buries in a cluttered Inbox anyway? Here is one way to keep that Inbox clean without missing mail! I prefer to use Windows Wireless Configuration, and cannot stand third-party apps trying to muscle in on my WiFi. That will allow you to use the Windows Wireless Configuration tool, as it should be! I ran into a situation where SuccessMaker would allow the students to log in but when they wanted to use one of the installed apps, the program would prompt for the CD. The school is running the Enterprise Edition of the software, so all apps are running from the server and do not require CDs. The culprit turned out to be a drive mapping issue. Make sure that the drive you use for SuccessMaker is MAPPED and not just pointing via UNC. Also, make sure that the drive is mapped in the appropriate login script, so you will not have to map it on each machine manually. On the "Audio" tab, there should be a drop-down under "Default Device." The default is usually "USB Audio Device," which is the Smart Board. Click the drop-down and choose the built-in audio instead (in this case, "Realtek HD Audio Output"). Click "APPLY" then "OK" and close out any Control Panel windows. Sounds will now play through the "green" plug in the back of the computer. To swicth back, return to Control Panel and change the "Audio" device back to the USB Audio.